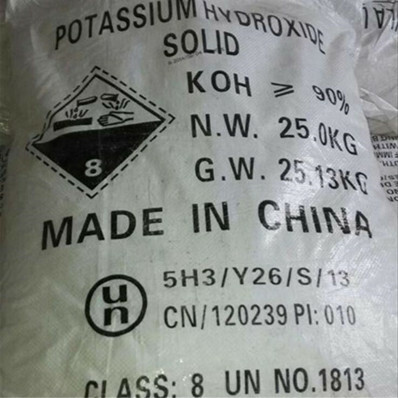 Potassium Hydroxide is white flakes or bead solid,with strong alkaline and corrosive. Easily absorb moisture in the air and absorb carbon dioxide turn into potassium carbonate,our supplied potassium hydroxide is manufactured via the "Ion-exchange membrane",Potassium hydroxide can be divided according to size: flakes and granular (bead), Beads Potassium hydroxide particles having a faster dissolution rate in water. 1) as raw material for the production of potassium salt, such as potassium permanganate, potassium carbonate, etc. 2) used in detergent industry as the raw materials producing soap, soft soap, shampoo, cream, shampoo and ointment ingredients. 3) Dyestuff Industry: as the raw materials the production of vat dyes, such as Vat Blue RSN, etc. 4) In the textile industry for dyeing, bleaching and silk, and man-made fibers used for manufacturing a large number, the main raw material of polyester fiber. 5) Battery industry for the manufacture of alkaline batteries. Delivery time: within 15 days after the order contract or order confirmed.